Available for the first time, we bring you import picnic pumps. Now popular import kegs can be easily dispensed. 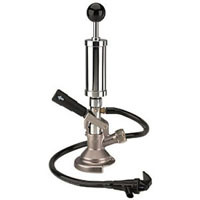 This pump features an integrated pressure relief valve, 4" chrome plated pump and a tin-nickel plated base combining to make a durable long lasting pump.